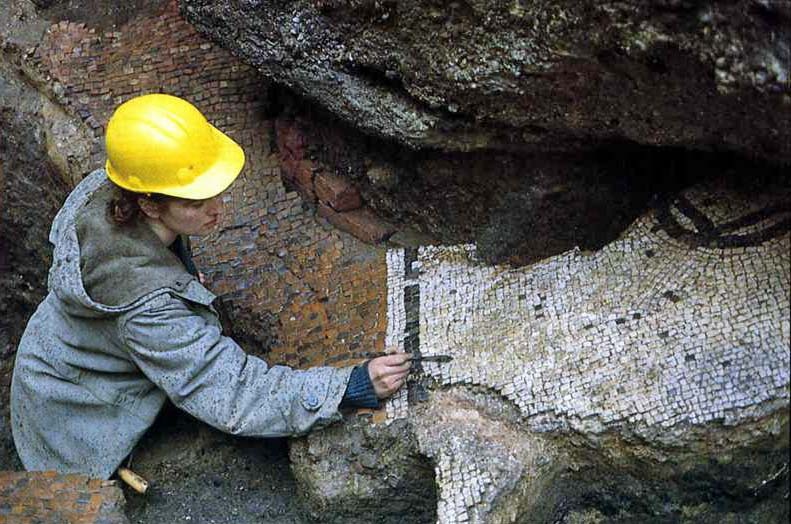 Angela Pertusini and heavily slumped Roman mosaic which was lifted on site by Dana Goodburn-Brown. The following group of photos were taken in 1987 on Gutter Lane (ABC87) – soon after the up to then ‘missing’ amphitheatre had been formally identified on the Guildhall Art Gallery site. I took the photos after climbing up the site tower crane on our final weekend – so they are essentially a series of panoramic aerial views of the skyline of the City at that time. 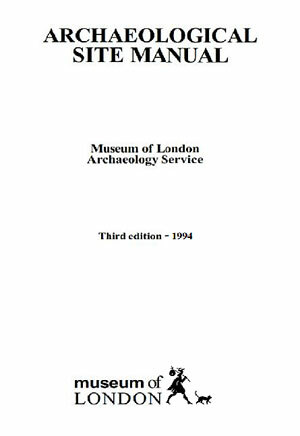 I was not alone in making the long climb, as a number of the other archaeologists subsequently followed me – and at one point I recall there being at least four to six of us standing on the gantry on the rear arm of the crane! It goes without saying that we were in sole occupation of the site at the time – which was the reason why our spontaneous site outing took place. As part of this enterprise, I had (for reasons unknown) thought what a great thing it would be to fill the drivers cab at the top with balloons – which is precisely what we did. Collectively, we spent a good couple of hours blowing the things up on site during our breaks. To get them up to the top of the crane they were hauled up the side of the tower in a net on the end of a very long length of string, and then had to be painstakingly fed one at a time through the trapdoor into the cab. Because the door was in the floor, it was effectively like trying to push the things into a loft space above your head –whilst keeping the hatch partially closed to stop them simply floating out again! In order to alert the crane driver to the fact that something was afoot (and I wish I could remember his name), we tied a number of balloons to the outside of the tower - which he would have passed on his slow ascent to his place of work on the following Monday morning. One of these ‘marker’ balloons can be seen fluttering around in the corner of a couple of the downward views of the site (which also shows 3 archaeologists on the ground – names on a postcard?). In the weeks that followed, the balloons could clearly be seen when you looked up at the crane from the surrounding streets – as the driver had gathered them together in a big bunch in the back of his cab.